The light weight deflectometer for dynamic plate load bearing testing was exhibited by TERRATEST at GAT 2016 in Essen. The trade fair for gas and water took place from the 8th to 10th November 2016 in Hall 3 at the Gruga Exhibition Ground. Alongside the Bluetooth device TERRATEST 5000BLU, TERRATEST presented the new light drop weight tester TERRATEST 4000Voice with user-friendly voice navigation. The user is guided through the measurement process by the electronic measuring system by spoken commands. This feature makes the handling of the falling weight deflectometer easy and comfortable, even for non-professionals. 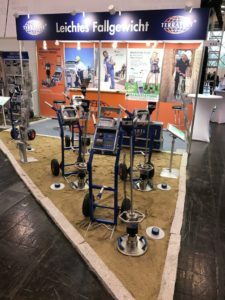 “We were able to have many interesting conversations at the trade fair, and above all, the fact that it was exclusively visited by trade professionals made it particularly interesting for TERRATEST.” says Falko Weiss, Sales Manager at TERRATEST. Alongside the trade fair, a broad programme of presentations and discussions about the topic of gas and water took place. At the centre of the event is the expansion of the gas network as a necessary addition to renewable energies. The LWD from TERRATEST are particularly in demand for pipeline construction, since they can be used cost-effectively and efficiently where space is at a premium, for example in pipeline digging. The compaction quality of the ground can be tested in just two minutes with the devices without a counterweight. In total, around 7000 industry professionals visited GAT 2016 in Essen, which was hosted by the German Technical and Scientific Association for Gas and Water (DVGW).